Registration and login as a PATRIC user provides additional capabilities not available through just navigating through the website alone. These include uploading data into a private workspace, access to analysis services, ability to save data in custom groups, and sharing data with other users. 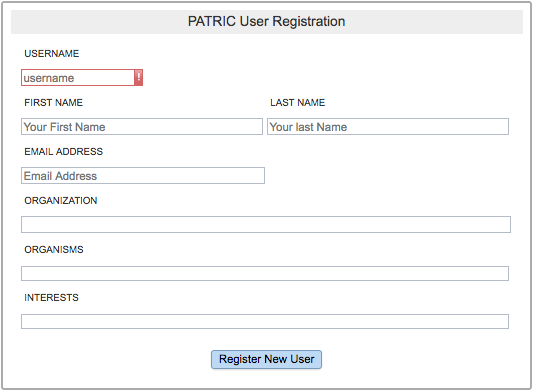 Clicking the “Register” button located at the top right corner of the PATRIC website will open the User Registration dialog box. A username and email address are required. The username will be the name you log in with, and the email address is required so that a link can be sent to you so that you can set your password. The other information is optional. Note: The registration information will remain completely private. Under no circumstances will PATRIC sell, distribute or lease this information to third parties. 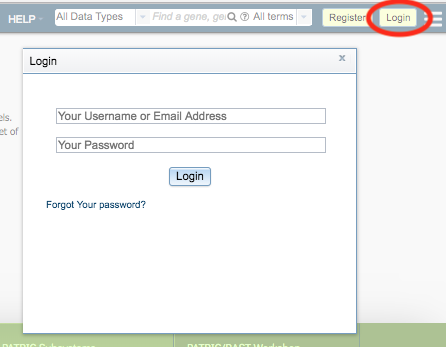 Clicking the “Login” button located at the top right corner of the website beside the “Register” button will open the Login dialog box, where a username and password are required to complete the login. Forgotten Password: Clicking the “Forgot your password?” link at the bottom of the Login dialog box will display another dialog box wherein you can enter your email address and a email will be sent with instrutions on resetting your password. Once logged in, the top right corner of the webiste will display an icon of a person. Clicking on this icon will allow you to see the account settings (username, email, etc.) and logout. Access to a private workspace wherein you can store, manage, and share private data. See Workspace. Access to analysis services including a variety of tools for Genomics, Transcriptomics, Metabolomics, and other analyses. See Services and Tools. Capability to create groups for storing and analyzing custom sets of data including genomes and features. See Groups. Capability to upload data, including batch file uploads, into the Workspace for analysis. See Data Upload.